The Legend of Zelda is a fine swansong for the WIi U and an even better beginning for the Switch. It is a must-have game thanks to its scope and depth and is already a contender for game of the year 2017. It might be early to be thinking such things but there’s every chance there won’t be another game as good as the latest Zelda this year. Yes, we have Mass Effect: Andromeda, Red Dead Redemption 2 and Super Mario Odyssey still to come in 2017, and they could get close, but everything about Zelda is jaw droppingly magnificent. It is a fine swansong for a dying generation and a glorious start for a new one. It is the very definition of a must-have game and deservedly leads the charge for Nintendo towards a new, Switch-flavoured future. The only problem is that it has consumed our lives so completely of late that we’ve barely seen our loved ones. Even slept. And thanks to the complete experience being available to play on Switch in handheld mode as well as docked, we’ve also carried on at the dinner table, during TV time, even on the loo. Damn you Nintendo and your incredible first-party games. Part of the problem is that Breath of the Wild is massive. Not just in the open-world map terms - although that is, indeed, mighty - but in scope and scale. There is so much to do in Hyrule that you could happily play for countless hours without doing many of the story quests at all. You'll want to, of course. Eventually. The plot is traditional Zelda fare, with you once again taking on the mantle of regular hero Link as he awakens from a century-long slumber. This time though, he has no idea of his destiny and has completely lost his memory. Worse, Hyrule has partly been reduced to rubble in the last 100 years, so not only must you eventually best series stalwart villain Ganon, you must also piece together what happened in the past beforehand. But we just buggered about for the first five or so hours – at least once the mainly tutorial missions were over. The game is clever in that you don’t feel like it is holding your hand, even when it is. And bar the first few acts, there are few designated paths you must follow. Indeed, deviation is often encouraged and rewarded. Dotted around the landscape are shrines, which contain either a puzzle or fight, and they always reward you. There are around 120 of them, with only the first few being necessary, adding essential powers to Link’s talent set and required to open the map further. The abilities gained are to be used constantly down the line, so it’s the only time the game feels linear. One is the power of magnetism, another makes huge pillars of ice appear out of water. They are all useful in the wild and essential in later puzzle shrines, but there is also so much more to learn and do. In fact, it’s positively overwhelming for a while. It is the first Zelda game to include a complex crafting system, for example, with the ability to make tasty concoctions from vegetables, animals and minerals you find dotted around the vast vista. These can refill heart containers – the health currency of Zelda games – and/or implement brief character effects, such as better stealth, speedier movement and the like. There are hundreds of recipes though, and discovering the right combinations is very much trial and error. You choose up to five ingredients and chuck them into one of the cooking pots scattered around. A successful jingle will sound with the better results, but unlike in real life, everything ends up being edible of sorts. Considering some meals can be made up of a bats eyeball and a frog, it’s somewhat a miracle. Like us though, you’ll spend plenty of time experimenting. And we found the better brews, stews and salad plates to be essential in later fights. Especially boss battles. Armour can be traded or found and can also be powered up through collectable items. You will need to find great fairies to do so, as part of side missions you stumble upon, but when done there’s the opportunity to improve all manner of gear. You'll also need to find specific items of apparel for different tasks and areas of Hyrule. For example, travel north and up a mountain and you might encounter snow and frosty temperatures - that silk blouse won't cut it for long and you could soon freeze to death. A nice, warm tunic will be needed in such places and shows the thought gone into every tiny aspect. Zelda games don’t offer character stats and progression as such, but all the way through the game you can swap spirit orbs acquired in shrines (once the runes have been earned) for either extra heart containers or stamina, and these improve your longevity if not your prowess. Pretty much anything energetic temporarily reduces stamina, whether it be climbing up the side of a mountain, running, swimming or hanging onto a flap of cloth which acts like a glider, and running out usually brings catastrophic consequences. But you will nearly always need extra heart containers instead, as some of the encounters you come across are very tough indeed. That’s partly thanks to the open nature of Breath of the Wild. Because you can go anywhere and do pretty much anything you want, in whatever order you want – even take on Ganon straight from the bat – you can often find yourself horribly underpowered for certain battles or incidents. Saving often is a must therefore, and while the game does have a very enthusiastic auto save, we still suggest you manually do so regularly. One way to retreat, power up and return to a tricky fight or shrine is to warp to a previously discovered teleport pad – usually activated when a shrine is found – find some new weapons and head back to the area you found hard before. Weapons are in plentiful supply, but good ones are harder to acquire. Worse still, almost every single weapon, bow and shield has a limited durability without the possibility of having them fixed. After a while, each and every one of them will shatter during use and you’ll be frantically swapping to the next best thing. You don’t start with many inventory slots for weapons or shields either, so clever management is a must. And you’ll find yourself saving the better weapons for the bigger monsters. It also makes you think more about strategy in combat. Just rushing headlong into battle will end with broken weapons, broken bones or both against anything other than the most basic of Hyrule denizen. The bows and arrows are a good way to snipe from a distance before taking out enemies. And learning how to block, parry and utilise Link's power attacks will be essential as you progress. You can increase weapon, shield and bow carry slots by collecting Korok seeds from hidden Koroks, by completing their own, unique puzzles, but you’ll never have enough. And you might even find yourself weeping when your favourite sword splinters during a savage boss fight. Another heart wrenching moment can come with the loss of a horse. Horses are back in a Zelda game and once you’ve caught, tamed and stabled at least one, you can ride them around the land to get from A to B more quickly. You can also whistle for them, a la The Witcher 3, although they don’t tend to come running if they aren’t in earshot. They can also be killed, which is a disaster if you’ve managed to find and grown fond of a particularly rare one. And with horse-centric mini-games on offer, you’ll have to start all over again with another initially unruly beast. To go into much more depth would be to give away many spoilers and that would be a crying shame for Breath of the Wild. It is a game designed for exploration and surprise. Each corner of Hyrule has something new and interesting to find, whether it be a new species of lizard or a completely new puzzle you hadn’t noticed before. It is a game that has taken many years in development but you can see why in every ounce of its being. It is graphically marvellous, on Switch certainly, with a nice adoption of partly cell-shaded models and surroundings, and while there are better-looking games on other consoles – Horizon Zero Dawn, for example – there are very few with the amount of depth and variety offered in this Zelda. The graphics when the Switch is docked are, says Nintendo, rendered in 900p and you do see a few rough edges. But we think that’s more because it was originally developed for (and also released on) the Wii U. Another caveat of that legacy is that when played on the 6.2-inch Switch screen in handheld mode, text can be very hard to see – it is, at times, miniscule. 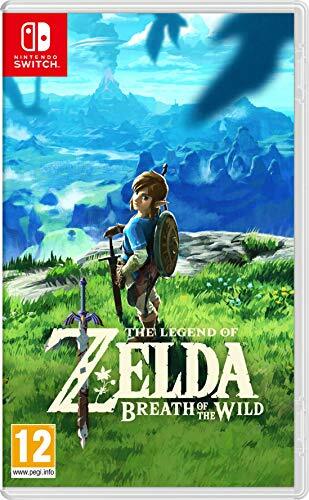 We suspect more thought would have gone into scaling fonts for smaller screen sizes had it been a Switch title from the off. That’s a minor complaint though, and certainly hasn’t stopped us playing the game whenever and wherever we could – on handheld or otherwise. Nothing could. It’s an old cliché that each console generation starts with a game that sells the hardware on its own. It’s also pretty much a lie. Neither the PS4 nor Xbox One launched with must-have games – they followed down the line. The Legend of Zelda: Breath of the Wild is such a game, however. It has been crafted with so much love, care and attention that you feel just as involved when playing. The sandbox you are given to play in is enormous and the game will eat time like a Sutton United goalkeeper eats pies. It is clearly the best game of the year so far, likely to be the best game of 2017 even by the end of December, and is a fine start for a games console that certainly needed one. A great Zelda game has always been synonymous with Nintendo success in the past. And for all that is good about gaming, let's hope that's the case this time too. We need Nintendo. You need Breath of the Wild.